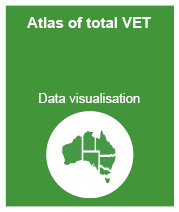 Presented here is an estimate of the extent and nature of vocational education and training (VET) delivered by Australian training providers. 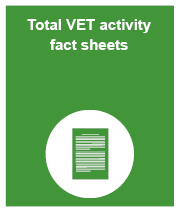 This picture of training activity is known as ‘total VET activity’ (TVA) and refers to all domestic and overseas VET activity delivered by all types of Australian training providers. It reports on students who undertook government-subsidised training and those who undertook training on a fee-for-service basis. 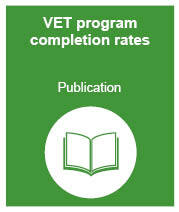 Information is provided on the number of training providers, students, program enrolments, subject enrolments, hours of delivery and program completions. 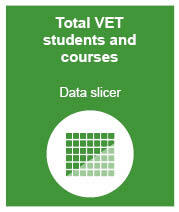 TVA data are sourced from both the National VET Provider Collection and National VET in Schools Collection. These collections are compiled under the Australian Vocational Education and Training Management Information Statistical Standard (AVETMISS). The complete infographic is available here. To view the collection results, please select the appropriate tool depending on whether you are a general, regular or expert user of data. Note: Some data visualisations are hosted externally and may request a login. Please click the Cancel button to continue to the visualisation. 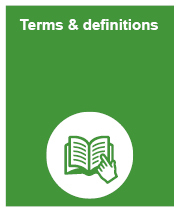 Have a sophisticated understanding of data and its uses, including terms and concepts. 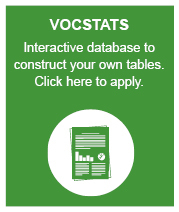 Note: Access to this detailed data in VOCSTATS and De-identified unit record files (DURFs) is free but requires registration. If you can't find what you need from the above tools, we may be able to provide you with customised data to meet your requirements. This service will be charged on a cost recovery basis. 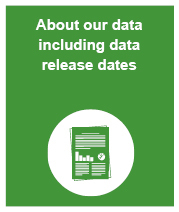 For more information, see Data access and charges: data and library information.